The originality of this painting, inspired by the religious works of the Renaissance, strives to represent Jesus as a vulnerable newborn infant protected in his mother’s hands. Mary’s naked feet parallel Eve, with her soles touching the earth, reminding us of where we come from. Her white shawl cascades like a river of life, also touching the earth, and connecting with us. The name Renaissance, comes from the french equivalent of the italian word rinascita, which literally means “rebirth” and describe the radical changes experimented in European culture during the 15th y 16th centuries. The renaissance was preceded by the Middle Ages and followed by the Reformation. According to the usual description, the Italian Renaissance of the 15th century, spreading through the rest of Europe, represented a reconnection of the west with the classical realism of antiquity, the absorption of knowledge during the renaissance —particularly mathematics—from Arabic, the return of experimentalism, the focus on the importance of living well in the present (e.g. humanism), an explosion of the dissemination of knowledge brought on by printing and the creation of new techniques in art, poetry and architecture in the renaissance led to a radical change in the style, and substance of the arts and letters. The renaissance was a very important time for the artist, they separate form the craft anonymity and become a professional in its own right. Renaissance artists are the first to be regarded as professionals. During the last quarter of the 20th century many scholars took the view that the classical realism of the Italian Renaissance was perhaps only one of many such movements. This is in large part due to the work of historians like Charles H. Haskins (1870–1937), who made a convincing case for a Renaissance of the 12th century, as well as by historians arguing for a Carolingian Renaissance. Both of these concepts are now widely accepted by the scholarly community at large; as a result, the present trend among historians is to discuss each so-called renaissance in more particular terms, e.g., the Italian Renaissance, the English Renaissance, etc. This terminology is particularly useful because it eliminates the need for fitting The Renaissance into a chronology that previously held that it was preceded by the Middle Ages and followed by the Reformation, which many believe to be inaccurate. The entire period is now often replaced by the term "Early Modern". Other periods of cultural rebirth have also been termed a renaissance; such as the Harlem Renaissance or the San Francisco Renaissance. The Renaissance was the transition from the Middle Ages to the Modern Age. 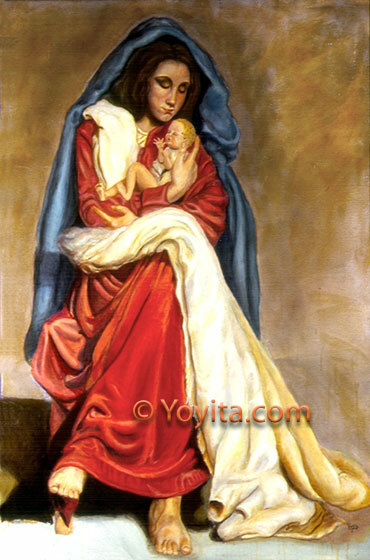 We are all familiar with the paintings of madonna an child of the Renaissance, come to mind the Great Masters of classical realism as Leonardo Da Vinci, Miguel Angel, Titian, Murillo, and many others. Sacred art was common during the European Middle Ages, and many of the greatest masters that were commissioned by the Roman Catholic Church lived during the Renaissance. It was during this time that Gianlorenzo Bernini created the massive columns in St. Peter's Basilica, Michelangelo Buonarotti painted the Sistine Chapel and carved the Pietà, and Leonardo da Vinci painted the Last Supper. Sacred art is imagery intended to uplift the mind to the spiritual. It can be an object to be venerated not for what it is but for what it represents. Roman Catholics are taught that such venerated objects are more properly called sacramentals.